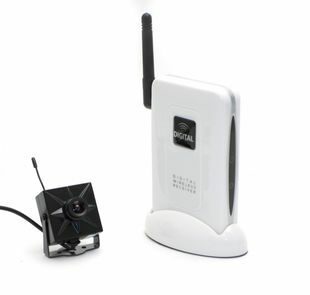 The HS420D Wireless Encrypted Digital Camera System features digital technology and boosted range. It's perfect whether you need a nanny camera, home or business surveillance, or automobile security. The improved camera features a 1/4" CMOS image sensor as well as a long transmission range of up to 200 meters in open space. Next-generation digital technology. Digital circuitry ensures no lost video due to external wireless devices, such as WiFi and cellular. 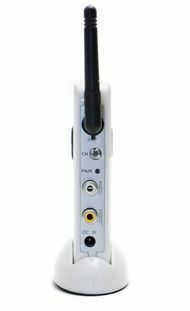 The transmitter uses the 2400MHz (2.4GHz) sub channels to eliminate interference from wireless routers. The digital nature as well as manual pairing of the camera and receiver means that nobody will be able to tap in to your signal and see your video stream! Effortless to use. Setting up the camera could not be any more painless. Simply connect the included AC adapter to the camera, then attach the wireless reciever to the VCR, television, or monitor, and pair the devices. Quality audio and video. Color video displays in 420 TVL resolution with a low light 3 LUX camera. Easily concealed. Covert video surveillance has never been easier. It's tiny size makes hiding this camera no problem. Hide in a plant, a book, a video case, air vent, automobile, the only requirement is to make sure the small lens is facing the video surveillance target. When properly placed, the wide camera angle will give you a complete view of a normal size room. Note: Requires RCA VCR or Monitor input.